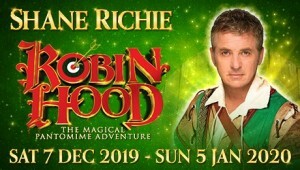 Hot off the heels of Cinderella, Hippodrome audiences will be over the (Alfie) Moon as soap legend Shane Richie stars as Robin Hood, in a pantomime packed full of high adventure, laugh-out-loud comedy, jaw-dropping special effects, audience participation and plenty of glitz and glamour. Don’t miss the ultimate pantomime adventure, Robin Hood, the most heroic outlaw of them all as the arrow-shooting hero strives to win the hand of the beautiful Maid Marion, with the help of his Merry Men and a panto-load of laughter. With generous discounts for groups, concessions and special rates for schools available for selected performances, be among the first to secure the best seats for next year and book your tickets for the sheriff-busting, arrow-shooting, hog-roasting, tights-wearing pantomime today!